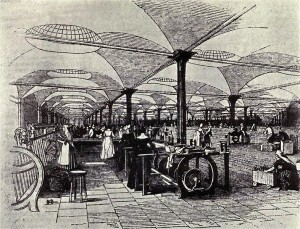 The Industrial Revolution began in Great Britain, where a number of technological advances increased quality of life and lead to a population boom that would continue into the 20th and 21st centuries. Among the most important of these advances were the mechanization of textile production, which became the dominant industry of the era, increased use of steam power, and new chemical and iron production processes. A wave of migration into cities from rural areas begins.